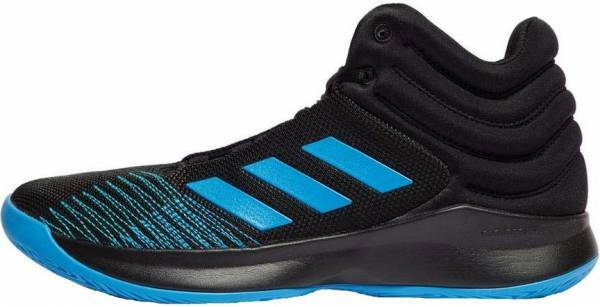 Many consumers give these Adidas basketball shoes high overall satisfaction scores. Several wearers report that the Pro Spark is comfortable. A good number of purchasers are happy with how stylish these Adidas shoes are. Like the Clyde Court Disrupt from Puma, some buyers say that the Adidas Pro Spark 2018 is very supportive. The computer stitchings and the synthetic overlays on the upper make it more durable, say some buyers. According to some testers, these Adidas shoes fit true to size. At least one wearer talks about how ‘admirable’ the traction of this shoe is. Players have a similar praise about the CP3 11’s traction. A handful of purchasers say that these Adidas sneakers are really a great buy. There is at least one wearer who says that water easily seeps through the upper material. The Adidas Pro Spark 2018 is a basketball shoe that delivers on the most important promises. It is said to be comfortable and supportive because of the Cloudfoam in its midsole. There are also mentions about how durable and valuable it is. The fact that it looks good is a great bonus. In direct contrast to its silent debut in 2018, the Adidas Pro Spark refuses to be silenced on court. Its textile and mesh upper deliver the amount of comfort and support that every athlete needs. Its outsole features herringbone, which is a traction pattern that rarely lets anyone down. Its Cloudfoam midsole works together with an eco-friendly Ortholite insole to deliver a comfortable and highly responsive ride. Cushion. Experience responsiveness that doesn’t falter with the Adidas Pro Spark 2018. This shoe has Cloudfoam in its one-piece midsole. It is reinforced by a comfortable ortholite insole. Traction. The rubber outsole of this shoe is described as soft and flexible. It features herringbone in its full length. The pattern is slightly modified in the sense that the edges are a bit rounded. Length and Width. Purchasers are saying that the Adidas Pro Spark fits them perfectly. Because of this, it is safe for new buyers to go with their usual Adidas sizes. Lockdown. Experience no-fail support with the 2018 version of the Pro Spark. This shoe has an anatomical fit, especially around the collar. Fit adjustments are made possible by its lace-up closure system. The textile and mesh uppers of these Adidas high-top basketball shoes keep the air flowing for a comfortable and breathable ride. The upper also has synthetic overlays and a characteristic computer stitching on the side to make it more durable. This model sports a largely tonal appearance. It has the Three Stripes prominently displayed on its lateral side. The collar area has soft grooves that give the shoe its distinct look. Basically, the shoe has very straightforward aesthetics. It is not difficult to pair with casual outfits and activewear.